A still image from the film that cost the owners of the Marshalls 203 fishing boat three million dollars. WASHINGTON, Sep 15 2016 (IPS) - In a giant step for transparency at sea, environmentalists on Thursday unveiled a website that allows anyone with an Internet connection to see for free exactly where and when most of the world’s industrial fishing boats actually fish. Called Global Fishing Watch, the satellite-based program is being described by scientists who have tested it as the strongest single tool so far to curb illegal fishing, which mostly affects poor countries. In some areas, like marine reserves or near-shore areas reserved for artisanal fisheries, the mere fact that an industrial vessel is fishing there is an indication of illegality. After SkyTruth sent to Kiribati the precise tracks that showed the ship had appeared to have fished several times inside the reserve, the captain confessed and the ship’s owners were fined two million dollars and donated an extra one million to Kiribati as a grant. That someone could be Josephus Mamie, head of Sierra Leone’s Fisheries Research Unit and a former head of its Fisheries Protection Unit. He says there are two to three times more ships fishing in the country’s near-shore waters than have licenses to do so. “Being able to see which vessels are fishing where would be a tremendous help in reducing illegal fishing,” he says. SkyTruth, with help from Google and from Oceana, a global non-profit headquartered in Washington, pioneered a computer algorhythm that shows, with over 80 percent accuracy, at what point in a ship’s tracks over the ocean is it engaged in fishing, and whether it’s purse-seining, long-lining or trawling, the three main methods. As previously reported, intensive and often illegal fishing of West Africa’s exceptionally rich waters by Asian and European fleets (which sell most of their take to Europe, Japan and North America) has drastically reduced the catch of the artisanal fishermen who sell their catch locally, depriving coastal populations of access to affordable animal protein and vital micronutrients. In another locus of industrial fishing, the Pacific Ocean, long-liners and purse seiners that go after tuna, billfish and sharks get most of their take from the waters of island nations for whom income from fishing licenses is a major part of the budget. Often, these legal vessels fish more than they are allowed. “This further reduces already depleted stocks and robs these states of much-needed revenue,” says Bubba Cook, the Western Central Pacific tuna program manager for the World Wide Fund for Nature. Kiribati is one such nation. Last year, it sent its lone patrol boat to chase down a Taiwanese purse-seiner registered in the Marshall Islands, the Marshalls 203, after a mandatory but imprecise tracking system, VMS, showed it spending time inside the Phoenix Islands Protected Area, the most fish-rich of the world’s giant marine reserves. The captain denied he was fishing, and the VMS track was inconclusive. John Mote, head of the country’s maritime police, contacted SkyTruth, which pulled up the ship’s tracks on the much more precise Automatic Identification System (AIS). Introduced in the 1990s as a short-range collision-avoidance tool used by ships to broadcast by VHF radio their position, speed and identity every few seconds, its signals are now captured by satellites and resold to governments, companies and non-profits like SkyTruth. According to Amos, after SkyTruth sent to Kiribati the precise tracks that showed the ship had appeared to have fished several times inside the reserve, the captain confessed and the ship’s owners were fined two million dollars and donated an extra one million to Kiribati as a grant. Starting Thursday, when it goes live, GlobalFishingWatch.com will allow Third-World governments, NGOs and even citizens to zoom in on their patch of ocean and see at a glance which ships are fishing where. The tracks will have a three-day delay but will stretch back to 2012. “This is going to revolutionize fisheries management,” predicts Jaqueline Savitz, Oceana’s vice president for the United States and Global Fishing Watch. “It does look like the thing that’s going to end illegal fishing,” agrees Douglas McCauley of the University of California in Santa Barbara, who has been testing it for months. The system has determined that 35,000 vessels exhibit fishing behavior and transmit their position on AIS. Of these, SkyTruth fully identified 10,000. Amos estimates that perhaps another 30,000 vessels do not use AIS, which the United Nations mandates is mandatory only in ships over 300 tons. McCauley expects the creation of Global Fishing Watch will build pressure on the United Nations to reduce the threshold for requiring AIS to vessels above 100 tons, which would include most of the world’s industrial fleet, compared to about 60 percent of it today. Amos of SkyTruth says his team discovered that some vessels had become quite creative in what he called “spoofing” – programming their AIS to transmit false information. This includes turning off their AIS in order to fish illegally or broadcasting a false identity or false position. “We once had a small Chinse fleet that gave its position as central Antarctica,” he recalls. So the team is teaching the computer to recognize these practices and set off alarms. For instance, a ship broadcasting it is not where it really is will be found out because its signal will be caught by the satellite over its true position. While most illegal fishing involves legally registered ships catching more than they are allowed, or fishing out of season or in areas for which they have no license, some companies opt for fishing completely illegally, changing names and flags and owners – usually shell companies – as fast as the authorities fine them. The so-called Bandit 6, illegally and lucratively catching toothfish off Antarctica despite being blacklisted everywhere, made headlines last year when they were chased away by a pair of Sea Shepherd ships. Peter Hammarstedt, a Sea Shepherd skipper who pursued some of the ships, says they rarely use AIS. But Amos has found that only less than one percent of the 35,000 vessels whose whereabouts GFW tracks indulge in suspicious activity. As a case in point, SkyTruth closely monitored the Phoenix Islands reserve, which was created in 2008 but was left open to almost unrestricted fishing until January 1, 2015. “One day there were dozens and the next day they were all gone, and only two of them had stopped transmitting on AIS,” Amos said. 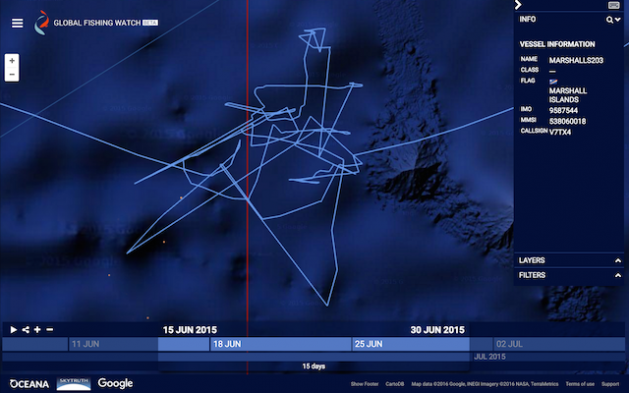 The Marshalls 203 was caught there in June, 2015. Daniel Pauly, a fisheries scientist at the University of British Columbia, says the hoped-for crackdown in illegal fishing comes none too soon. While the United States has reduced fishing enough so that some of its fish stocks are growing again and Europe is taking steps to do likewise, in the rest of the world, “It’s catch what you can because if you don’t, someone else will.” Pauly says that making fishing a more public activity will not only make it harder to fish illegally, but will address the main problem confronting fisheries managers and scientists everywhere: lack of data.